Today’s labor markets are undergoing radical change, as digital platforms transform how they operate and revolutionize the nature of work. In many ways, this is a positive development, one that has the potential to match workers with jobs more efficiently and transparently than ever before. But the increasing digitization of the labor market also has at least one very worrying drawback: it is undermining the traditional employer-employee relationships that have been the primary channel through which worker benefits and protections have been provided. The trouble is that even as these sites provide new opportunities for workers and companies, they are bypassing the traditional channels through which the US and many countries deliver benefits and protections to their workforce. In the US, in particular, the “social contract” has long relied on employers to deliver unemployment insurance, disability insurance, pensions and retirement plans, worker’s compensation for job-related injuries, paid time off, and protections under the Fair Labor Standards Act. Although the Affordable Care Act has made it easier for workers to acquire health insurance on their own, most workers continue to receive health insurance through their employers. With the proliferation of digital job platforms, the social safety net for workers in the US – threadbare to begin with – is at risk of unraveling for a growing share of the workforce. This is because most individuals who find work through digital job platforms operate as independent contractors, leaving them without the benefits and protections provided in standard employment contracts for full-time and part-time workers. The difference between the cost of a full-time employee with benefits and an independent contractor can be 30% or more, so there is a strong incentive for companies to replace workers on standard full-time employment contracts with independent contractors as long as companies can attract the talent they need. Digital job platforms also make it easier for businesses to hire and fire workers on temporary contingent contracts. This creates the potential for a race to the bottom, with employers competing on labor costs through regulatory arbitrage. Unless policymakers act, the US will continue to drift toward a two-tier labor market. One tier will be populated by fully employed high-skill workers with generous employer-provided (and tax-advantaged) benefits, as well as high-skill individuals who finance their own benefits from high incomes earned as independent contractors or from self-employment. The other tier will include a large pool of contingent middle- and low-skill workers without the benefits, income, or security on which a robust and resilient middle class depends. Two recent proposals incorporating these conditions call for the creation of “individual security accounts” analogous to US Social Security accounts, but encompassing portable benefits that would be available to all workers, regardless of employment status, and would accrue via pro-rated automatic payroll contributions. A group of strange bedfellows – “gig” employers, labor organizations, venture capitalists, and bipartisan think tanks – recently issued a letter calling for a stable and flexible safety net based on these conditions. Meanwhile, in Congress, forward-looking policymakers like Senator Mark Warner of Virginia are seeking ways to get ahead of the issues and create momentum for bipartisan solutions. Much remains to be done before a new safety net for all workers is in place: determining which benefits and protections to include, how to pay for them, and how to deliver them to workers. Labor groups, including unions or new types of labor organizations like Coworker.org and the Freelancers Union, could fill the gap, providing benefits as unions have done in the construction industry and guilds have done in the entertainment industry. In Silicon Valley, where thousands of contractors and freelancers are hired every week, new private companies like MBO Partners are emerging to handle the benefits of contingent workers who work for many employers. 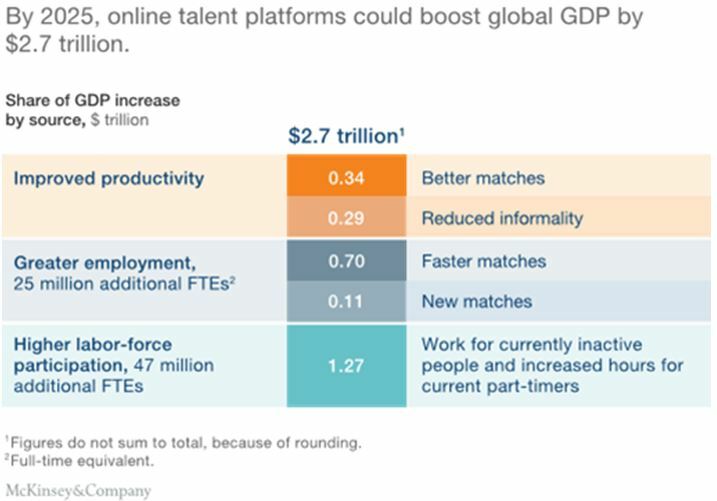 The McKinsey Global Institute estimates that digital labor platforms could increase US GDP by 2.3% and US full-time equivalent employment by 2.7% by 2025. But realizing these economy-wide gains while providing a secure and portable safety net for all workers will require new ways of thinking by companies and policymakers. Author: Laura Tyson is a professor at the Haas School of Business at the University of California, Berkeley. Lenny Mendonca is a former director of McKinsey & Company. Image: A Chinese student surfs the internet. NB/PB.